The Yeti ARC ranks high among my list of all time favorite bikes. 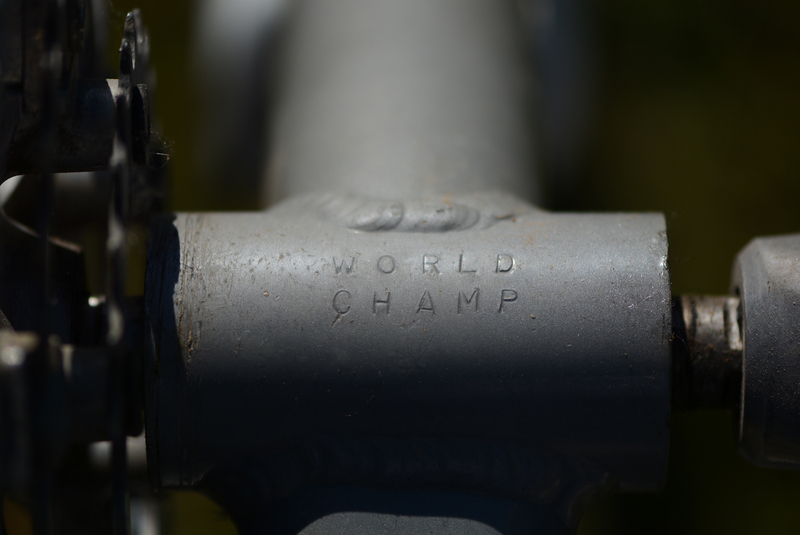 Not only because it's such a fun bike to ride, but also because so many victories were earned on one by some of the most influential racers in the early days of the sport. The evolution of the bike is fairly well known to those who care about such things, and most of the early development bikes are fairly well documented. One bike however, a missing link if you will was never seen and only depicted in one magazine article. The bike was presumed broken and trashed since it was replaced fairly early in the 1991 racing season. However and unlikely set of circumstances led to its discovery sitting in a shed in Colorado a couple months ago. 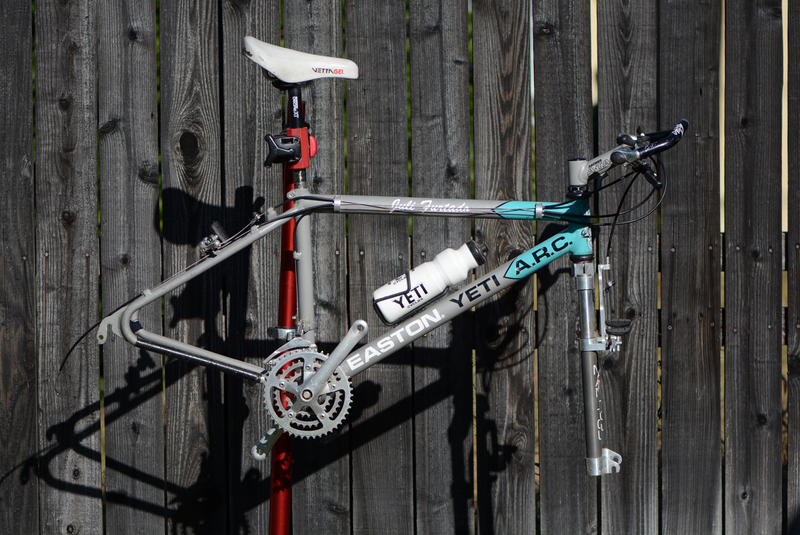 The bike in question was the first Yeti ARC given to Juli Furtado for the 1991 season after winning the World Championships onboard a C-26 in 1990. 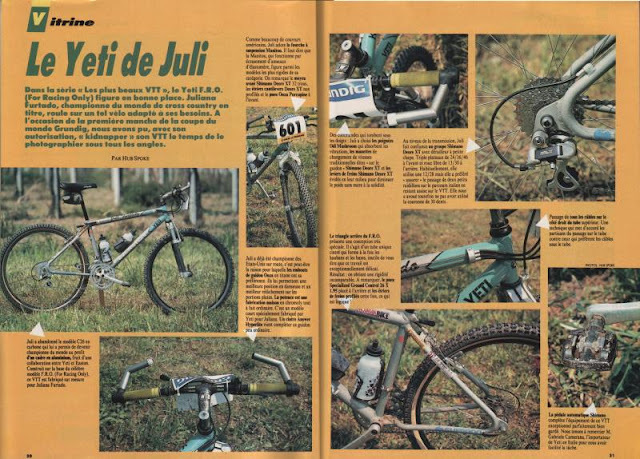 For a thorough history of Juli racing the Yeti ARC in 1991 check out Rideavintagemtb's blog post. The bike represents a significant evolutionary milestone in the development of the ARC. 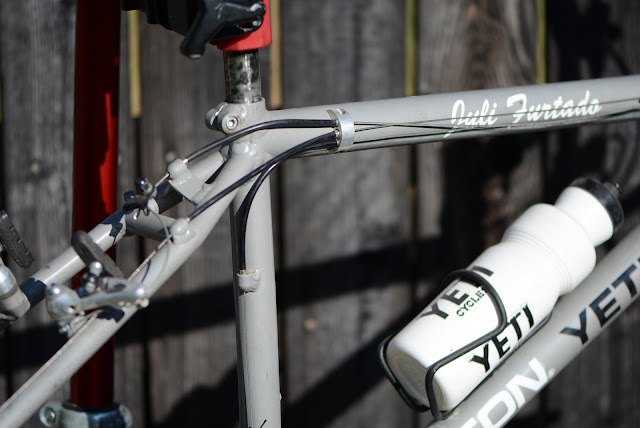 The front end is made from the then new Easton 7005 series alloy, which the rear end is made out of 6061 as Easton hadn't yet developed the ability to shape the 7005 tubing to match the loop stay shape that Yeti wanted. 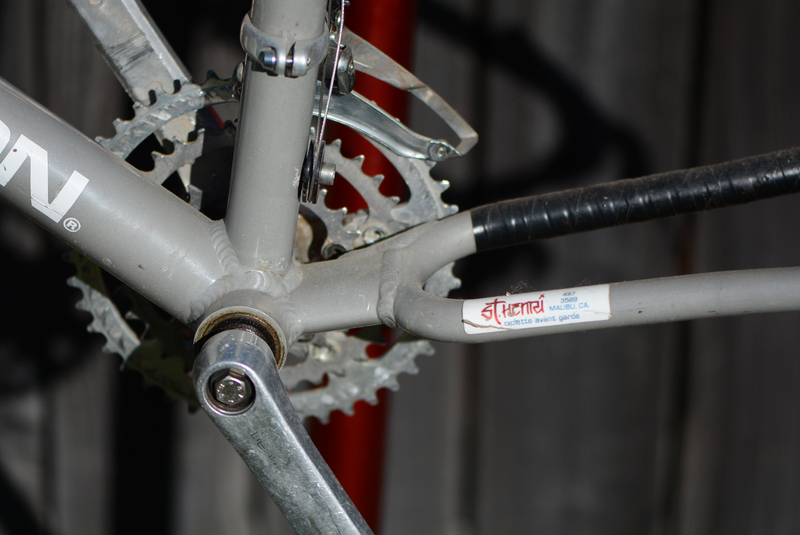 Remember the very early prototypes had straight rear stays with traditional dropouts. 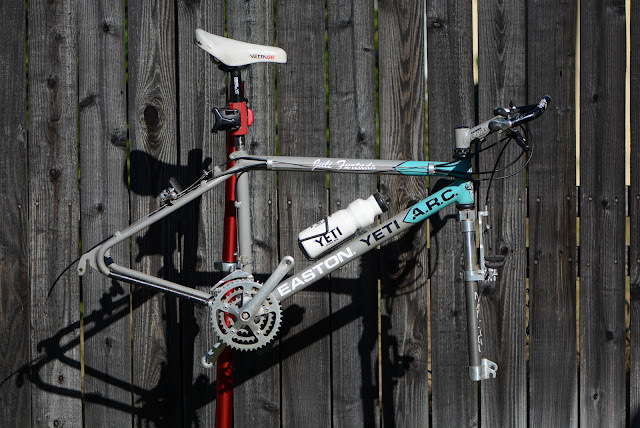 So, this bike was the first Aluminum Yeti to showcase the tried and true loop stay design that was a stape of Yeti bikes since their inception in 1985. It looks as though the bike was refinished at some point after Juli stopped racing it. Most of the sponsor and race decals are gone and the bike looks a bit too fresh to have been raced on. Hard to know for sure though as Yeti commonly switched decals on their race bikes from one venue to another. Unique cable stops were made to accommodate the round top tube which preceded the oval design. This is fairly similar to how the early FROs evolved. 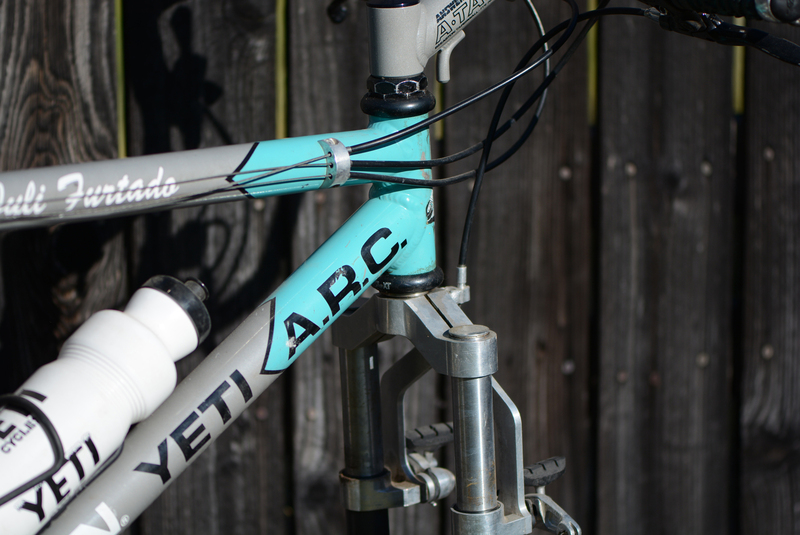 First ones had round top tubes before Yeti was able to figure out the tooling to make the oval sections they wanted. 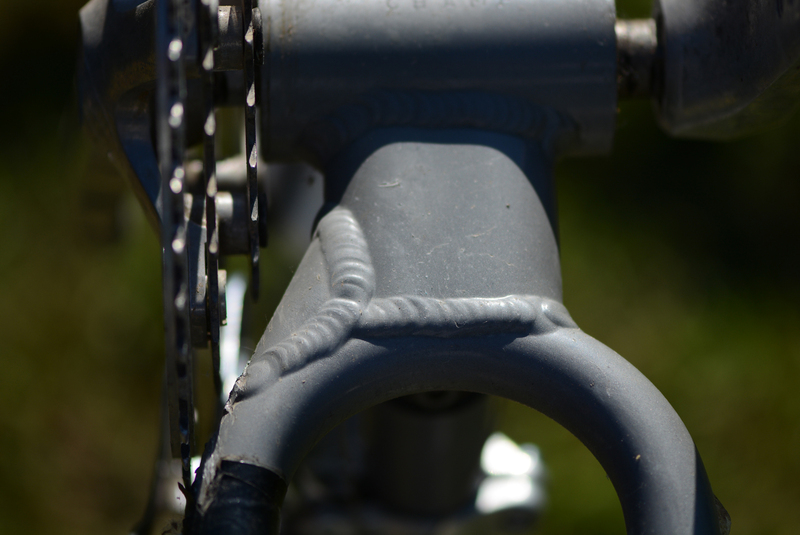 The cable stops underwent a small change before settling on the design we all know. The #90 O'Mara ARC had a slightly refined version as seen in the photo below. The turquoise on this bike also seems a bit brighter than what I've seen on production bikes. Vinyl cut letters instead of die cut decals were used on this and other early ARCs. A fairly simple cockpit consisting of an ATAC stem, Hyperlite bars, XT controls (still running thumbies) and Bradbury made Manitou fork rounding out the package. Undoubtedly one of the coolest features of this bike is the FRO like rear end. Not seen on any other ARC the use of it here highlights the thinking that took place at Yeti when building the ARC. They went with what worked (wishbone with gusset) since that's the design that evolved on the beloved FRO. 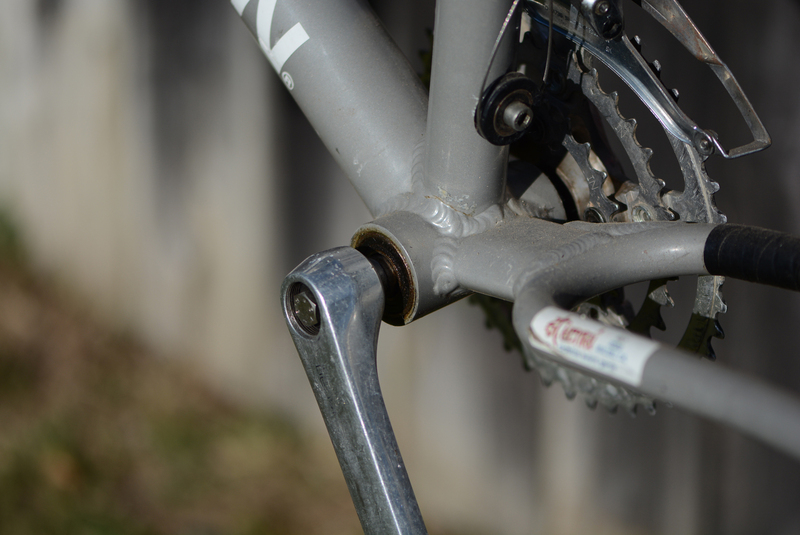 A common feature of the early Yetis is the relatively short stub of seat tube above the top tube. 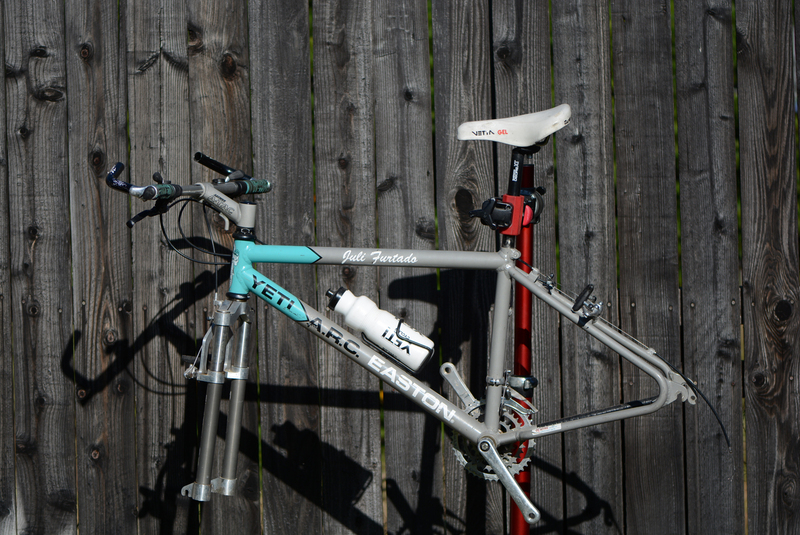 The #90 ARC race bike of Johnny O'Mara had a similar design with only an inch or so of the seat tube extending above the top tube. This is the only Yeti I've ever seen with pressed in bearings. Not exactly sure why they did this, it certainly adds to the uniqueness of this frame. 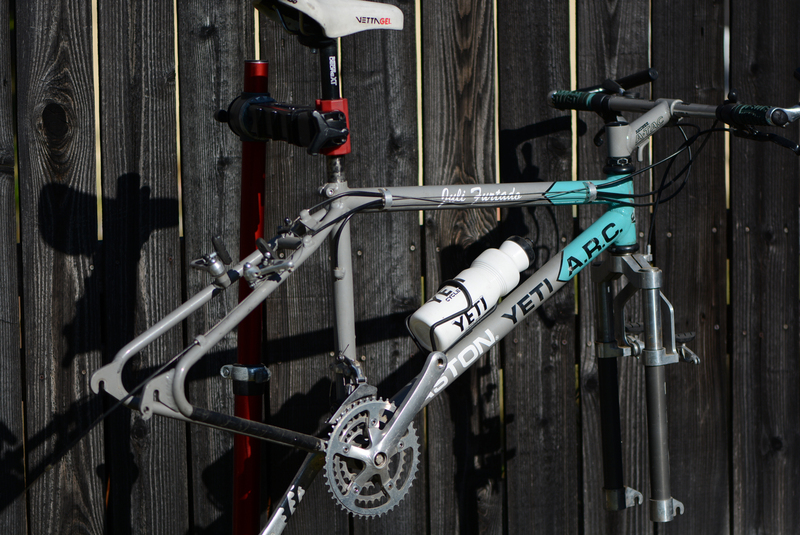 St. Henri bike shop in Malibu was a big supporter of Yeti in the early days. 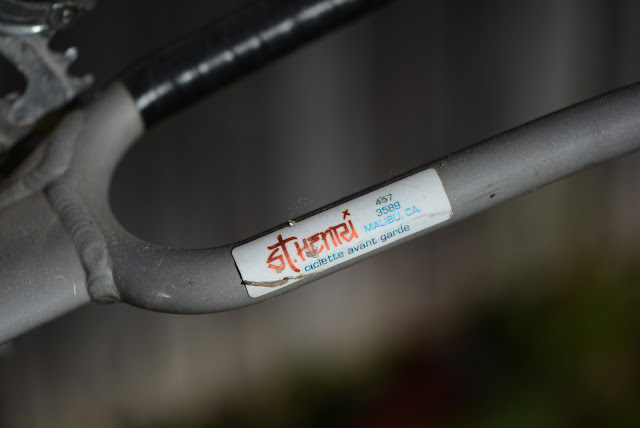 I've seen this sticker on some ex-Yeti Tioga Tension Disk Drives as well as a few other team frames. 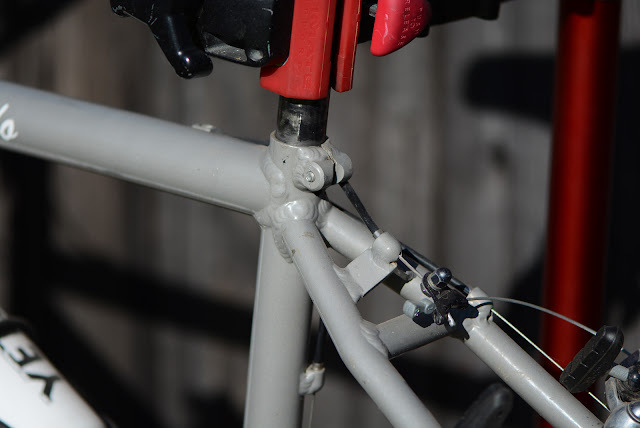 A closeup shot of the reinforced gusset connecting the wishbone to the loop stays. Seems sturdy! 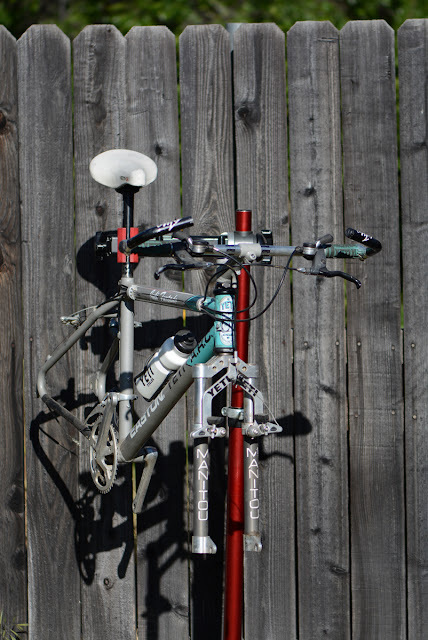 The plan is to rebuild the bike as close to as Juli would have raced on, combining it with a Steel Yeti stem and mostly shimano XT parts as seen in the photo spread at the beginning of this post. Stay tuned to see this race machine returned to life! Regarding the pressed in BB: not sure this has anything to do with it, but I remember reading that Furtado used custom narrows spindles for a smaller Q-factor because of knee problems.